Most Kickstop products are designed to strengthen and reinforce inward opening doors against 'kick-in' attack and outward opening doors against jemmy attack. The two DoorGuard products are designed to complement other Kickstop products when they are fitted to a door with glazed or weak panels. Door panel grilles are recommended to increase security - often to a rear door. An inexpensive DoorGuard Grille can be purchased and fitted extremely quickly - as the need arises. The design of the doorGuard Grille means that it is very easy to transport as it folds for transportation. Is very easy to fit with 16 zinc plated hardened steel woodscrews supplied. It will fit most doors without alteration and provides instant security with apertures still large enough to allow glass cleaning. 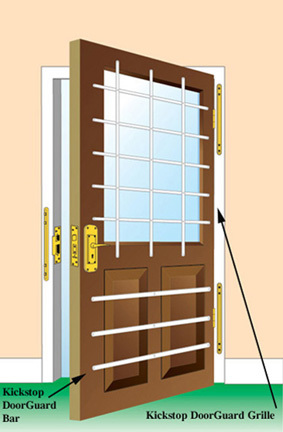 Door panel security bars are also recommended to increase security - often to a rear door. A combination of inexpensive DoorGuard Bars does not have to be measured in advance and can be purchased and fitted extremely quickly - as the need arises. They are very easy to fit with 3 zinc plated hardened steel woodscrews supplied with each single bar. They will fit the width of most doors without alteration and provides instant security and can be positioned to allow access glass cleaning. The bars are recommended for internal fixing. If they are used externally, we suggest that security screws or fixings are used.